Everywhere I visit, people want to talk with me about the future of independent higher education. 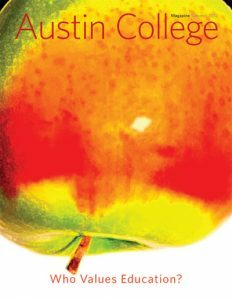 Class of 2012 graduate Anne Deming reflects on her Austin College years as she travels to Hong Kong in her new position with the Osgood Center for International Studies in Washington, D.C.
An Austin College education is built around top quality academic experiences. At the core of those is a faculty of experts dedicated to student success. Four examples are highlighted. President Marjorie Hass addresses some of the recent attacks on higher education, urging a look at the true worth of higher education and its impact on society. The Austin Teacher Program sows seeds of excellence each year as its faculty prepares teachers to move into their own classrooms and educate the next generation. Carmen Tafolla ’72 has had a tumultuous 2012—witnessing highs and lows in her own life, educational systems, and her hometown. She writes of her hope for the possibilities of the future. John Hitt ’62 has never left college, spending his career in academics and the last 20 years as president of University of Central Florida in Orlando.